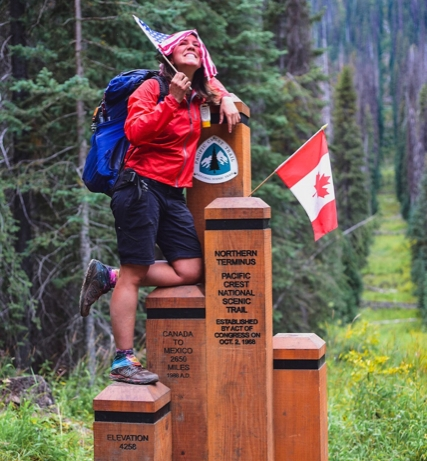 On September 8th, I hiked into Canada on the Pacific Crest Trail. Most hikers who reach this monument are finally done with their thruhikes. For the past month, everyone around me—-including my hiking partner for over 1,000 miles—-has been emotionally preparing to start the next chapter of their lives post-PCT. Honestly, I wish I were done, too. But I still have Oregon to go back and hike. You see, I’m a flip-flopper—someone who attempts to complete the entire trail within one calendar year by tackling it in large sections (as opposed to moving in one continuous direction, say, from south to north). I also flip-flopped the Appalachian Trail in 2016, walking from central Virginia to Maine, then flying to Georgia to hike from Springer Mountain back to Virginia. Flip-flopping is a style of thruhiking that really works for me because I like doing things my own way. But it has its drawbacks. I chose to flip-flop the PCT only after attempting a northbound (NOBO) hike, then realizing that I wouldn’t be able to make it to Canada before the snow started. Even though I had started at the US/Mexico border on March 26th, I chose to leave the trail four times for career trainings in the SF Bay Area. These comings and goings compromised my NOBO plans. Fires: I’ve skipped over sections that are currently on fire or suffering low visibility. For instance, by the time I get to Crater Lake in Oregon, I’m hoping that it will be back to its usual beautiful self (last month it was almost completely obscured by smoke). Since fires are the new normal on the PCT, this is an important “pro” of flip-flopping. Avoiding rain in Washington: I hiked Washington in August, which is the perfect time to not get rained on there! Shaking things up: I did a large chunk of California heading southbound when the majority of hikers on the trail at that time were northbound, and I loved how this allowed me to run into NOBOs I hadn’t seen since the desert. Going south for a while was a fun change of pace from the usual march northward. Plus, since few others were going southbound at that time, I never got passed by faster hikers (which I hate) nor had to worry about how to tactfully pass slower hikers. Less impact on the trail: there are so many hikers on the PCT these days that staggering usage is pretty much mandatory for the health of the trail. It also spreads out business for the people and trail towns along the way who are making a living by serving the hiking community. Avoiding “the herd”: I personally dislike being part of a big bubble of thruhikers, though I know some people are really into the party atmosphere and/or feeling of camaraderie that hiker bubbles might have. I get stressed out when it feels like I am competing with other hikers for tent sites or bunk beds in a trail town hostel, and I feel badly for trail towns when I see a herd of hikers descending upon them. Case in point: I was heading south through Sierra City in early July when the main bubble of NOBOs was heading north through there, and there were so many hikers in the town that the trash bins were literally overflowing with wrappers and cardboard from food resupply boxes. A woman at the town church told me that they are considering banning hikers from staying there because there are so many of us now that the lawn is dying and there are bits of trash everywhere. No bueno! Solitude: if you really want a nature immersion experience, going NOBO from Campo around mid- to late April will most definitely not provide you that experience. Instead, flip to sections where the single-direction thruhikers have yet to reach. Time to rest or do other activities besides hiking: flip-flopping gives you a wider window in which to hike the whole trail, so you can take more time off during your thruhike to heal your body, spend time with family/friends, attend a conference or career training, etc. Easier resupply logistics: when you’re a flip-flopper, you don’t need to pack resupply boxes for the whole thruhike in one sitting. On my PCT flip-flop, I pack food boxes for the upcoming leg of the journey and no more. 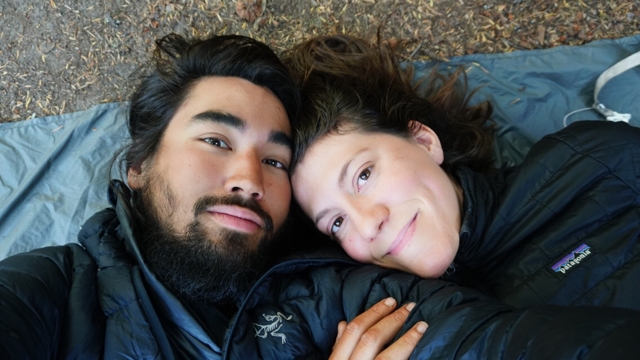 Maintaining a trail relationship or trail family: flip-flopping gave me multiple opportunities to hike with a wonderful man who did a traditional NOBO hike. If you need to leave the trail for some reason but your trail family is continuing without you, you can skip over a section and flip up to wherever your buddies are. Then, go back and do that skipped-over section later. Sensei and I fell for each other around Julian, CA. Flip-flopping allowed me to hike on and off with him for a total of 1,100 miles. After flip-flopping two long trails, I don’t have too many negative things to say about it. But there is one major challenge it presents: flip-flopping can make you feel disconnected from the experience of the other hikers around you. Now, on my PCT thruhike, it literally and figuratively feels like I have to go backwards to finish Oregon. The folks I’ve been with throughout Washington are done with their hikes, but because I have left the trail for about 40 days total, I am not. If everyone else around you is finishing, what’s keeping you going—especially when you have to get on a bus/train/plane to travel to a different section of the trail (the added expense of which, come to think of it, is another downside to flip-flopping)? This brings me to another major drawback: flip-flopping seriously challenges your momentum. Thruhiking a long trail takes a great deal of determination no matter what. But successfully completing a flip-flop thruhike takes even more perseverance and resolve. I could easily rationalize the 2,100 miles I’ve already hiked as good enough. I’m ready to be done. When I get up to walk after sitting down for more than ten minutes, my calves seize up and I literally hobble until my overworked legs warm up again. I miss my friends and family back home and I’m excited to begin a new career. I’m sick of eating processed food and being smelly/dirty all the time. Most of all, I’m tired of hiking 12 hours a day every day. 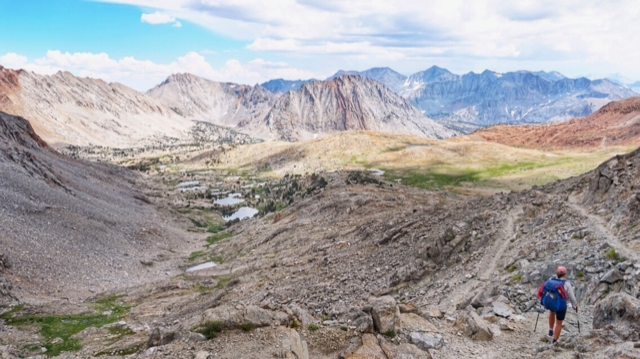 Flipping back to hike the High Sierra in July was one of the best decisions I made on my PCT thruhike. But I had an epiphany as I approached the northern terminus of the PCT. Before thruhiking, routines had always felt repressive, imposed upon me by authority figures. Then, I decided to pursue a goal that was mine and mine alone: to hike thousands of miles across America, first on the Appalachian Trail and now on the PCT. In committing to this extended journey, I unwittingly signed up for a whole lot of routine! So, once the thruhiking honeymoon phase ended, I had no one by myself to blame for the hours and days and weeks and months of monotonous hiking. This has given me a perspective I’ve never before understood. I know now that a routine isn’t inherently repressive. A routine can be liberating. Structure can be self-care. Discipline can be freedom. Yes, a routine like hiking 12 hours a day almost every day for 5 months can feel monotonous. But without constructing boundaries to protect and direct our precious time on this earth, our goals can never be realized. Without structure, dreams like thruhiking are just ideas that burn bright in our hearts before fading out. Without discipline, we risk a frazzled, fragmented life in which purpose and meaning are obscured by distractions. By finishing the trail, I am not just renewing my commitment to hiking the entire PCT. I am committing to a life of discipline. I am committing to finishing what I start and doing what I say I am going to do. I am choosing to see routine and discipline not as boundaries that cage me in, but as tools that help me channel my time and energy into achieving dreams and goals bigger than I ever thought possible. Are you ready to do things your own way? Are you ready to find out just how determined, brave and capable you really are? Well then…I’d say flip-flopping is for you. Are you ready to do things your own way? Are you ready to find out just how determined, brave and capable you really are? I am hiking the PCT as a fundraiser for girl empowerment nonprofits that are getting more young women outside. In celebration of my 2,000-mile mark on the PCT, an anonymous donor has generously agreed to match all contributions made in the next week. Will you join us in supporting underprivileged girls to go on personal transformation journeys in nature? 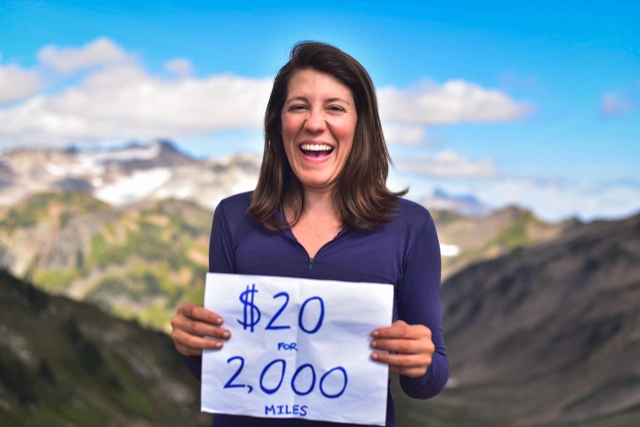 Contributing 1¢ for every mile of the PCT I’ve hiked so far would add up to $20. Give $20 now and $40 will go towards helping a girl from a low-income family get outside. Thank you! Hello – so good to hear from you, as I had been looking for your YouTube videos and wondered where you were. I have been thinking of doing the AT flip-flopping, but more so that I could see some of the gorgeous flowers in spring time and not slogging through the rain and mud with leafless trees all around. Also, since I am older, and slower, I might not be able to finish the whole thing in 1 year – as I do still have to work to survive. Oregon should go much faster less up and down or at least not as high as CA & WA. Bravo on hitting the 2000 mile mark. Flip-flopping is great for both the AT and the PCT! I encourage you to do it. Yeah, sorry I haven’t been great about keeping up my YouTube channel…but I just posted a video today! Thanks for following along.